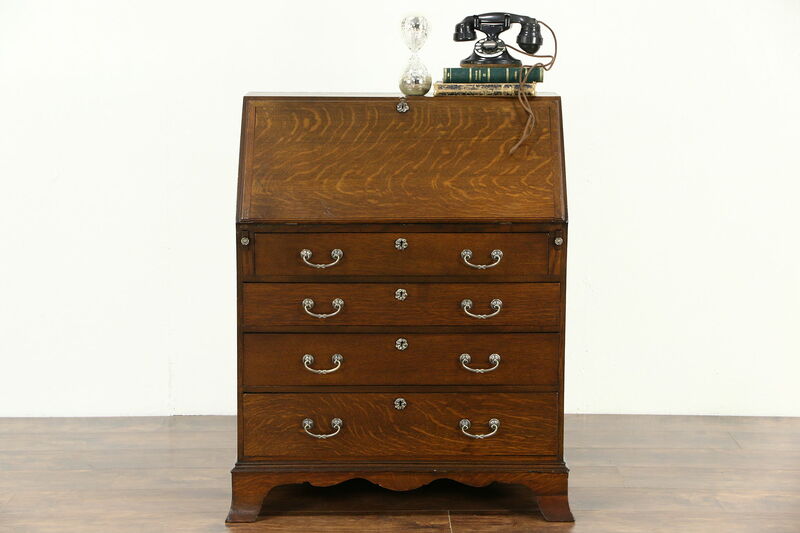 A sweet little secretary desk was hand crafted of solid quarter sawn oak in England about 1900. The restored finish is in excellent condition, preserving just enough mars and ink stains for a little antique character. Drawers have solid mahogany sides with hand cut dovetail joints on this historic furniture. Embossed hardware is original. The front rests on pull out supports when opened. There are mars and dings on the gold tooled leather writing surface. Keys are handles only for the drop front and interior door, locks do not work. Measurements are 32" wide, 17" deep, 38 1/2" tall and the desktop is 28" high.